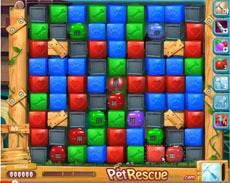 To be honest with the desperate pet rescuers that will try to pass pet rescue level 624: As the level is structured, it’s a clear matter of luck if you’ll pass it or not. Some bombs fall above the screen while playing. With these bombs you have to destroy the metal boxes under the pets, or/and release some pets from their pet boxes. If you are lucky and these bombs fall in the suitable positions then you’ll make it to pass the level, but if not, there is no chance to pass it without boosters. So, we have to tell you just this: Repeat the level as many times as you can, hoping that you’ll be lucky once and try to let (if possible) passage for the bombs to reach the bottom of the screen, so that to destroy the metal boxes under the pets.